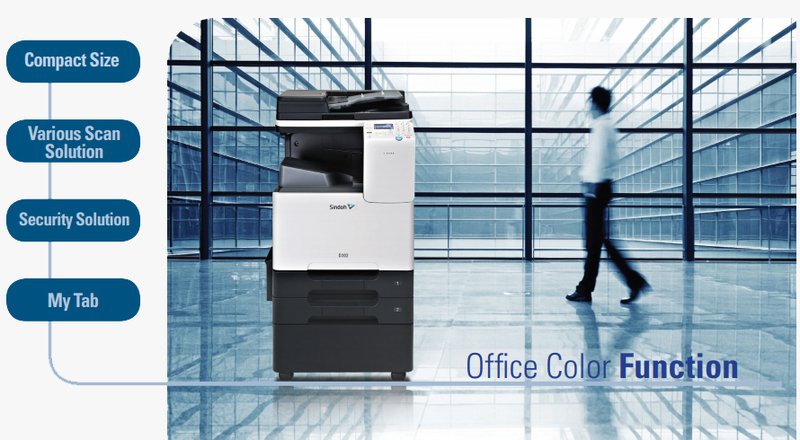 High-Performance, Cost-effective MFP with Outstanding Design! Sindoh’s D201 and D202 are Easy-to-use Multifunction Devices that boost your business productivity. With its Advanced Functions, it provides a more convenient business environment and boosts business productivity. A scanned document can be printed, saved as a file, or easily transmitted through various formats such as e-mail or PCs. The ADF automatically detects the paper size of the original document when it is being scanned. The My Tab feature of the printer driver offers User-oriented Functions for Better Performance. The High-end Capability improves any business environment with Advanced Convenience Features. Both sides of an ID card can be easily copied to a sheet of paper. To copy a card, such as an insurance card, ID card, or business card, Place both sides of the card on a page as instructed on the screen to copy the images of both sides on the same piece of paper. You can select a color for copying a document. The product is set up to automatically print a scanned document in color or B&W. When using the red and black color recognition function, the use of toner can be reduced. Automatic Color: The printer automatically selects the color or B&W printing according to the color of the scanned document. All Colors: The document is copied in color regardless of whether the scanned document is in color or B&W. B&W: The document is copied in B&W regardless of whether the scanned document is in color or B&W. Both sides of the document can be copied or printed without installing additional option. Its design is optimized for printing MS Excel and MS PowerPoint documents, which are commonly used in business environments. It helps you easily print the created documents. MS Excel Print This function prevents separate printing when the MS excel sheets with different print options are printed at once. ※ This function is enabled only by the Windows printer driver and may not be supported in some environments or application software. User-Centered Design maximizes user satisfaction by providing optimized solutions for better efficiency and advanced security. The built-in utility software manages the device. Users can simply connect to the device from a PC, check the condition of the device, and configure various settings as needed. If there are too many papers to scan that cannot be loaded into ADF all at once, they can be loaded in bundles and still be scanned as a document. This function prevents the leakage of information from the output document. When a copy-protected document is copied, the hidden watermark is displayed on all pages to show that the copy was not authorized. A3 or 11" x 17"
※ Fax is an option.